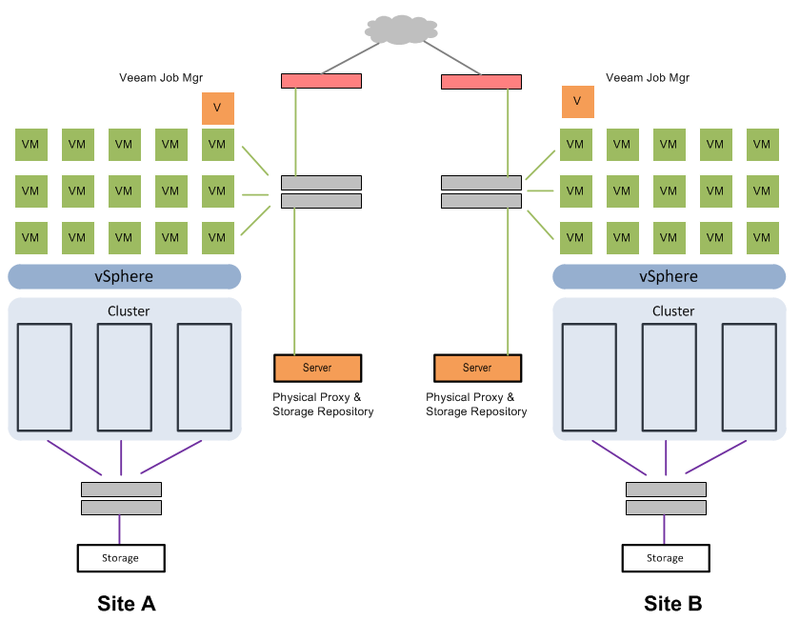 I’ve been using Veeam Backup and Recovery in my production environment for a while now, and in hindsight, it was one of the best investments we’ve ever made in our IT infrastructure. It has completely changed the operational overhead of protecting our VMs, and the data they serve up. Using a data protection solution that utilizes VMware’s APIs provides the simplicity and flexibility that was always desired. Moving away from array based features for protection has enabled the protection of VMs to better reflect desired RPO and RTO requirements – not by the limitations imposed by LUN sizes, array capacity, or functionality. While Veeam is extremely simple in many respects, it is also a versatile, feature packed application that can be configured a variety of different ways. The versatility and the features can be a little confusing to the new user, so I wanted to share 25 tips that will help make for a quick and successful deployment of Veeam Backup and Recovery in your environment. There are two sites that need protection. VMs and data need to be protected at each site, locally. VMs and data need to be protected at each site, remotely. A NAS target exists at each site. You’ve already read all of the documentation. In this arrangement below there would be no physical servers – only a NAS device. This is a simplified arrangement of what I use. If one wanted a rebuilt server (Windows or Linux) acting purely as a storage target, that could be in place of where you see the NAS. The architecture would stay the same. Below is a combination of both, where a physical server is acting as the Proxy, but like the virtual proxy, is using an SMB share to house the data. In this case, a NAS unit. These tips focus not so much on ultimately what may suite your environment best (only you know that) or leveraging all of the features inside the product, but rather, getting you up and running as quickly as possible so you can start returning great results. 1. Have the job Manager server, any proxies, and the backup targets living on their own VLAN for a dedicated backup network. 2. Set up SNMP monitoring on any physical ports used in the backup arrangement. It will be helpful to understand how utilized the physical links get, and for how long. 3. Make sure to give the Job Manager VM enough resources to play with – especially if it will have any data mover/proxy responsibilities. The deployment documentation has good information on this, but for starters, make it 4vCPU with 5GB of RAM. 5. Keep the design simple, even if you know you will need to adjust at a later time. 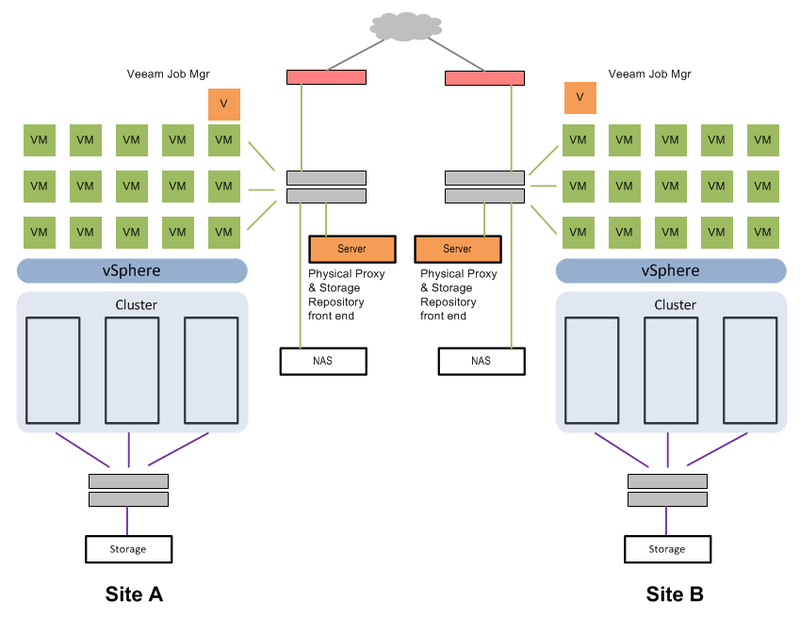 Architectural adjustments are easy to do with Veeam, so go ahead and get Veeam pointed to the target, and start running some jobs. Use this time to get familiar with the product, and begin protecting the jewels as quickly as possible. 6. Let Veeam use the default SQL Server Express instance on the Veeam Job Manager VM. This is a very reasonable, and simple configuration that should be adequate for a lot of environments. Some storage arrays do not have a "read-only" iSCSI connection type. When this is the case, special care needs to be taken on the physical server directly attached to the SAN to ensure that it cannot initialize the data store. The reality is that you are one mistake away from having a very long day in front of you. I do not like this option when there is no secondary safety mechanism from the array on a "read-only" connection type. Direct-from-SAN access can be a very good method for moving data to your target. So good that it may stress your backing storage enough (via link saturation or physical disk limits) to perhaps interfere with your production I/O requirements. Additional efforts must be taken when using write buffering mechanisms that do not live on the storage array (e.g. PernixData) . 8. 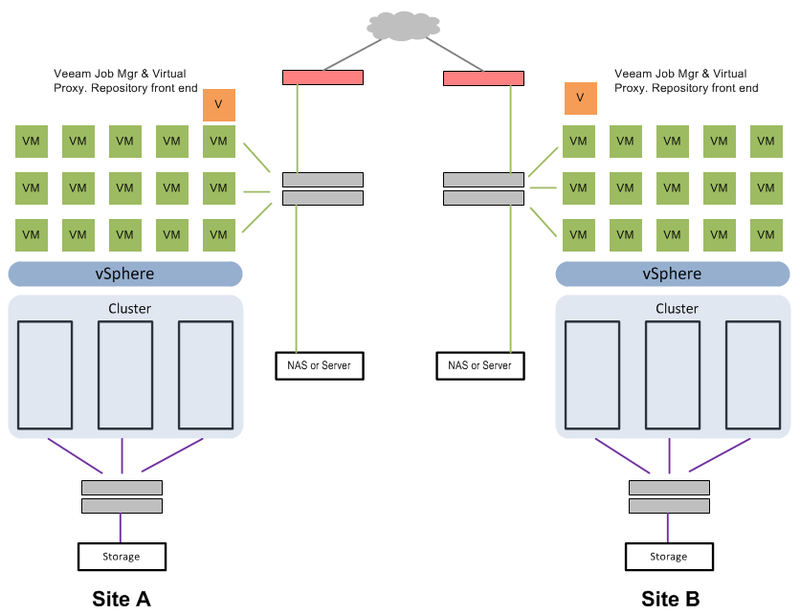 Veeam has the ability to back up to an SMB share, or an NFS mount. If an NFS mount is chosen, make sure that it is a storage target running native Linux. Most NAS units like a Synology are indeed just a tweaked version of Linux, and it would be easy to conclude that one should just use NFS. However, in this case, you may run into two problems. The SMB connection to a NAS unit will likely be faster (which most certainly is the first time in history that an SMB connection is faster than an NFS connection) . The Job Manager might not be able to manage the jobs on that NAS unit (connected via NFS) properly. This is due to BusyBox and Perl on the Synology not really liking each other. For me, this resulted in Veeam being unable to remove sun setting backups. Changing over to an SMB connection on the NAS improved the performance significantly, and allowed for job handling to work as desired. 9. Veeam has a great new feature (version 7.x) called a "Backup Copy" job, which allows for the backup made locally to be shipped to a remote site. The "Backup Copy" job achieves one of the most basic requirements of data protection in the simplest of ways. Two copies of the data at two different locations, but with the benefit of only processing the backup job once. It is a new feature of Version 7, and although it is a great feature, it behaves differently, and warrants some time spent before putting into production. For a speedy deployment, it might be best simply to configure two jobs. One to a local target, and one to a remote target. This will give you the time to experiment with the Backup Copy job feature. 10. There are compelling reasons for and against using a rebuilt server as a storage target, or using a NAS unit. Both are attractive options. I ended using a dedicated NAS unit. It’s form factor, drive bay count, and the overall cost of provisioning was the only option that could match my requirements. 11. 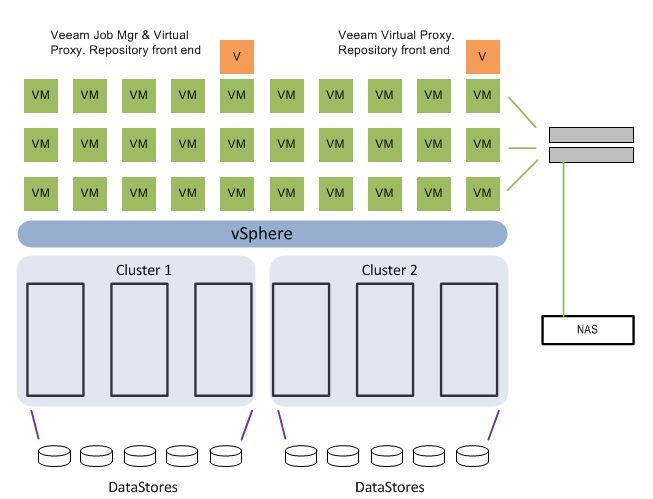 In Veeam B&R, "Replication Jobs" are different than "Backup Jobs." Instead of trying to figure out all of the nuances of both right away, use just the "Backup job" function with both local and remote targets. This will give you time to better understand the characteristics of the replication functionality. One also might find that the "Backup Job" suites the environment and need better than the replication option. 12. If there are daily backups going to both local and offsite targets (and you are not using the "Backup Copy" option, have them run 12 hours apart from one another to reduce RPOs. 13. Build up a test VM to do your testing of a backup and restore. Restore it in the many ways that Veeam has to offer. Best to understand this now rather than when you really need to. 14. I like the job chaining/dependency feature, which allows you to chain multiple jobs together. But remember that if a job is manually started, it will run through the rest of the jobs too. The easiest way to accommodate this is to temporarily remove it from the job chain. 15. Your "Backup Repository" is just that, a repository for data. It can be a Windows Server, a Linux Server, or an SMB share. If you don’t have a NAS unit, stuff an old server (Windows or Linux) with some drives in it and it will work quite well for you. 16. Devise a simple, clear job naming scheme. Something like [BackupType]-[Descriptive Name]-[TargetLocation] will quickly tell you what it is and where it is going to. If you use folders in vCenter to organize your VMs, and your backups reflect the same, you could also choose to use the folder name. An example would be "Backup-SharePointFarm-LOCAL" which quickly and accurately describes the job. 17. Start with a simple schedule. Say, once per day, then watch the daily backup jobs and the synthetic fulls to see what sort of RPO/RTOs are realistic. 19. Repository organization. Create a good tree structure for organization and scalability. Veeam will do a very good job at handling the organization of the backups once you assign a specific location (share name) on a repository. However, create a structure that provides the ability to continue with the same naming convention as your needs evolve. For instance, a logical share name assigned to a repository might be \\nas01\backups\veeam\local\cluster1 This arrangement allows for different types of backups to live in different branches. 21. When in doubt, leave the defaults. Veeam put in great efforts to make sure that you, or the software doesn’t trip over itself. Uncertain of job number concurrency? Stick to the default. Wondering about which backup mode to use? (Reverse Incremental versus Incrementals with synthetic fulls). Stay with the defaults, and save the experimentation for later. 22. Don’t overcomplicate the schedule (at least initially). Veeam might give you flexibility that you never had with array based protection tools, but at the same time, there is no need to make it complicated. Perhaps group the VMs by something that you can keep track of, such as the folders they are contained in within vCenter. 23. Each backup job can be adjusted so that whatever target you are using, you can optimize it for preset storage optimization type. WAN target, LAN target, or local target. This can easily be overlooked, but will make a difference in backup performance. 24. How many backups you can keep is a function of change range, frequency, dedupe and compression, and the size of your target. Yep, that is a lot of variables. If nothing else, find some storage that can serve as the target for say, 2 weeks. That should give a pretty good sampling of all of the above. 25. Take one item/feature once a week, and spend an hour or two looking into it. This will allow you to find out more about say, Changed block tracking, or what the application aware image processing feature does. Your reputation (and perhaps, your job) may rely on your ability to recover systems and data. Come up with a handful of scenarios and see if they work. Veeam is an extremely powerful tool that will simplify your layers of protection in your environment. Features like SureBackup, Virtual Labs, and their Replication offerings are all very good. But more than likely, they do not need to be a part of your initial deployment plan. Stay focused, and get that new backup software up and running as quickly as possible. You, and your organization, will be better off for it.